The biggest news at the fair was Osram have become Ledvance by Osram with the aim of being simply Ledvance at some stage in the future. Osram had all of their new range of retrofit LED lamps on show as well as their “over the counter” Luminaires. 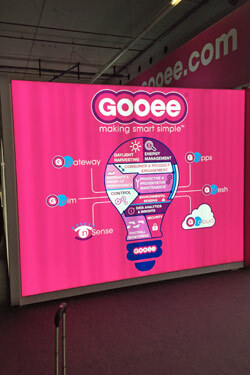 The Osram stand was one of the biggest at the show and very well attended. 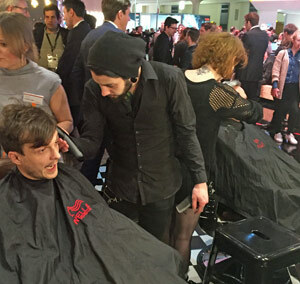 There was an area on their stand known as 1906 to commemorate the formation of Osram in 1906, drinks and food were available in this area and you could even get yourself a haircut on the stand! There were, as you would expect, many companies offering LED Variants to Squirrel Cage or Edison bulbs both dimmable and non-dimmable, but there were plenty of new innovative lamps on display also. Some wonderful large Edison lamps in various shapes and styles, we particularly liked the 250mm Diameter Megaglobe lamp that caught our eye. LED was clearly the theme on most stands with most traditional filament Lamps now having an LED retrofit available. 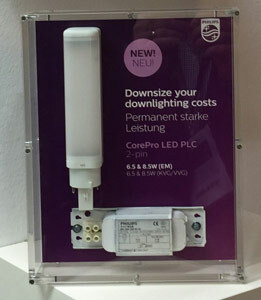 We did see however a few new types Philips showed their LED PLC compact lamp “CorePro LED PLC” and we also saw LED PLL replacements from Chinese manufacturers. We also noted that most manufacturers are now offering Dim to Warm LED Lamps. This technology decreases the colour temperature of the lamp as it is dimmed down and increases it as it is lit up, this is to replicate how a filament lamp behaves when dimmed. Megaman’s Dim to Warm lamps were a particularly good example. Smart lighting control has been a big topic over the last couple of years and many Zigbee controlled lamps and fixtures were on display as you would expect. But some companies had taken things a stage further. We saw Chinese streetlighting manufacturers displaying LED Streetlights that were WIFI enabled, had car charging stations and controls that could send signals back to a central station to monitor traffic flow and identify bottlenecks in road systems at certain times of the day. Sylvania now under the ownership of the giant Chinese manufacturer Feilo were showing their organic response Luminaires with Integrated Lighting control. Organic response Luminaires have movement integrated sensors that detect motion, and light and can send information to other Luminaires in the chain. Organic response enabled Luminaries can detect movement in a room and ensure that only the area with movement in it is lit , as luminaires are linked when movement occurs organic response luminaires will ensure that there is enough light in the area that is required and will dim luminaires down when the occupant has moved on. There were some really impressive decorative fixtures on display in the decorative halls that really showed off some wonderful creative talent. British manufacturer Plumen exhibited there range of Plumen 1 and Plumen 2 lamps along with a new clever click together rod system to create modern looking pendants.